I've been in serious correspondence with a prestigious American graphic designer about ornamental rhubarb plants. Apparently the giant Gunnera gets confused with the littler Rheums, and my contact was puzzled. Naturally I leapt in learnedly to help, offering not only my great rhubarb expertise, but my Rheum as the real thing. Luckily for me the designer didn't use my photograph! This plant started off being 'some sort of Rheum' when first it was mentioned in my gardening journals. This loose description should have warned me. But no. This spring I noticed stalks with pale pink flowers at the top, well before any leaves had formed - an odd flowering habit for an ornamental rhubarb. Did any alarm bells ring? No! Oops. It's not a Rheum, it's a Darmera peltata! Quite by accident, while trying to improve my plant identification skills in Botanica's Annuals and Perennials reference book, I found its flower picture. Oh dear! It's given the common name of Indian Rhubarb, so I guess I can be partially forgiven! 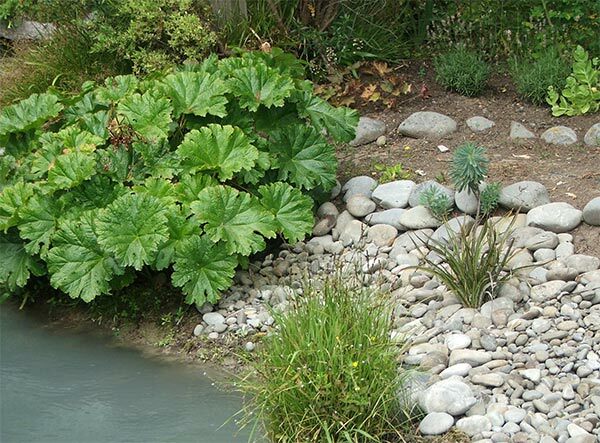 It grows happily by the water race, and recently I've landscaped the bank with river stones. I like the look, and my clump of Indian Rhubarb is thriving. But this is a timely warning to all would-be designers who google for images to use and land, bottom first, in the mulch at Mooseys. Be warned! Do not necessarily believe everything that the Head Gardener thinks she knows!